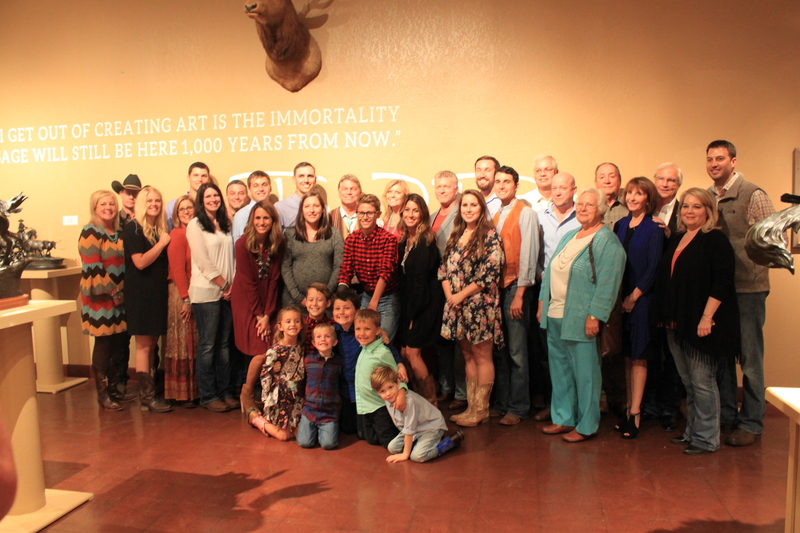 On the evening of Oct. 14, at Woolaroc Museum outside Bartlesville, Okla., family and relatives of the Western sculptor and painter, the late John D. Free, gathered. 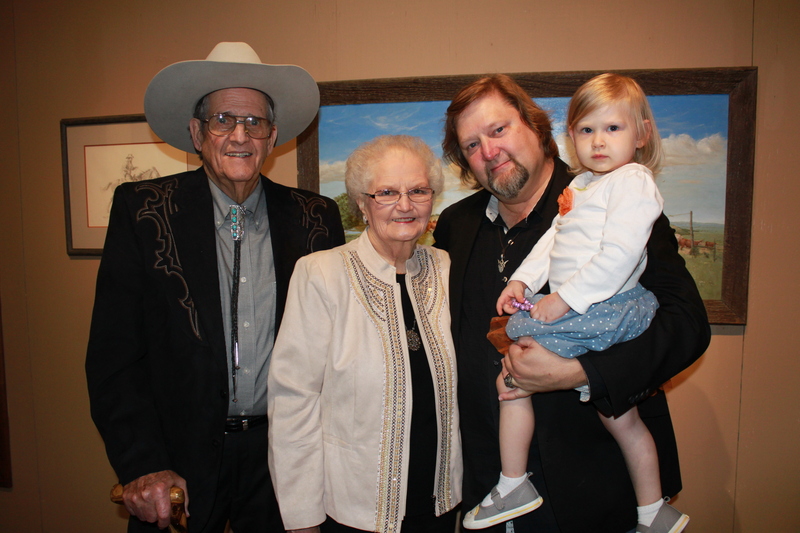 Among those in attendance were sons of the artist: John, Mark and Matt Free, the artist’s sister, Delores Theis, her husband, Raymond Theis, and their son, Chris Theis. His son, John Free spoke at the Tribute first. “Dad was born in Pawhuska in Osage County. His grandmother was a full-blood Osage. He was very proud of that heritage and that part of his life. “Probably the most important thing that happened to him was that he grew up on his grandfather’s ranch. That boyhood growing up on the ranch, of course he didn’t know at the time, would be the focus of his whole life from then on. He learned about horses and being a cowboy and about cows. He learned from his grandfather about being an old rancher was at that time. That was so special to him … and a tremendous influence and it shaped his art career probably in a way no one ever imagined. “He was always drawing and modeling as a little boy. He was always drawing horses, and cow and cowboys; he said he did this for as long as he could remember. Free shared that at these shows, his father encountered artists who encouraged him to believe that his career could grow. “You’ve got to remember back in the late 50’s, early 60’s, he was making a living from the art business. “The most important thing that happened at that time – he did a one-man show at the Gilcrease Museum and a man named Thomas Lewis approached him and asked if he would be in his gallery at Taos, New Mexico. “Lewis was a great artist and a great gallery man and he took dad under his wing. He taught him about painting. And the most important thing he did was to give him clay and said see what you can do with this. Dad returned with one of the first sculptures that was cast into bronze. It was a cowboy, I think, roping a wolf. Thomas Lewis sold that piece and that was the beginning of a relationship between a gallery owner and an artist. And from then on dad’s career grew. “He was in galleries in New York City, Carmel, California, all throughout the Southwest. He stayed busy doing things that he never dreamed that he could stay busy at and make a living. 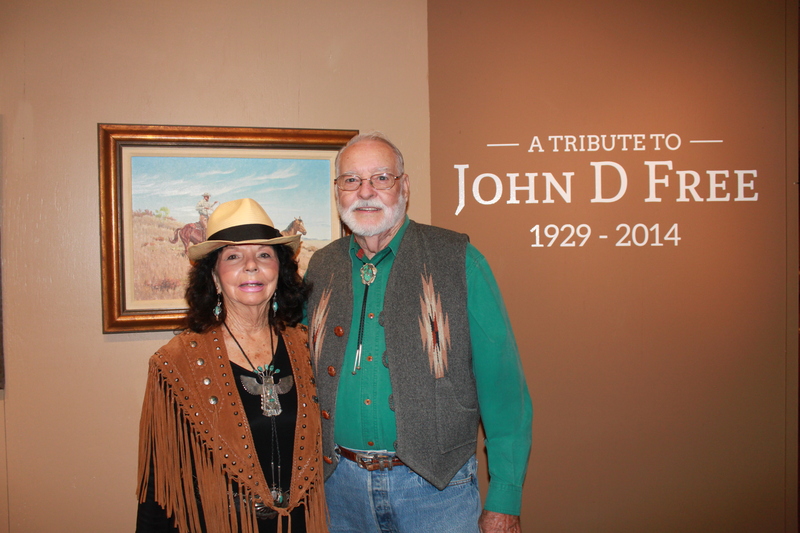 “He was named a member of the National Academy of Western Art at the Cowboy Hall of Fame, the Cowboy Artists of America, and also the Free West, which was the old Academy of Western Art. He was always proud that he was a member of these organizations. “At this time, he was travelling a lot. The art business allowed him to do something else he was happy to do and that was to fly. He was able to buy a plane and fly to these places. That was something he’d always wanted to do and this allowed him to do that. He was a pilot and his son, John Free flew with him and loved it too, he said. “He flew a 175 all across the United States,” John Free said. 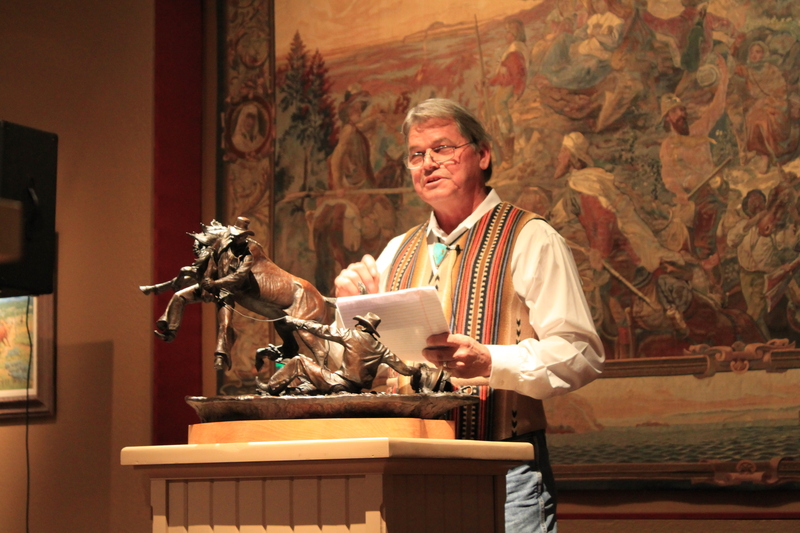 “In 1980 he partnered with his brother-in-law, Ed Bivens, and they opened the Bronze Horse Art Gallery, which is still operating today [in Pawhuska]. Our family has worked for more than 100 artists and we produce thousands of sculptures that have gone all the way across the United States and around the world. He was always proud of that – that through these endeavors he was able to open a foundry and see a lot of artists’ careers start from that foundry and grow. We’ve been doing it for over 30 years. It’s hard to believe. “Dad said he was always fortunate to make a living doing something he loved so much. And if he didn’t do it making a living, it would be his hobby. “He said he looked forward to being able to continue to press his ideas, impressions and beliefs through the language of sculpting and painting in a simple and traditional manner. “He always did a lot of research and he read a lot, which gave him ideas for pieces. And he also liked telling the stories to his grandkids about things he learned about. “And probably last, but not least, the greatest influence in his art career was probably his wife, Rhema, without her, he probably would not have had a career. As an artist, taking care of business is not what you do. And mom was his partner, accountant, bookkeeper, scheduler, travel agent, the buffer between him and the rest of the world. And she did it very well. Next, the artist’s nephew, Chris Theis, spoke at the Tribute. 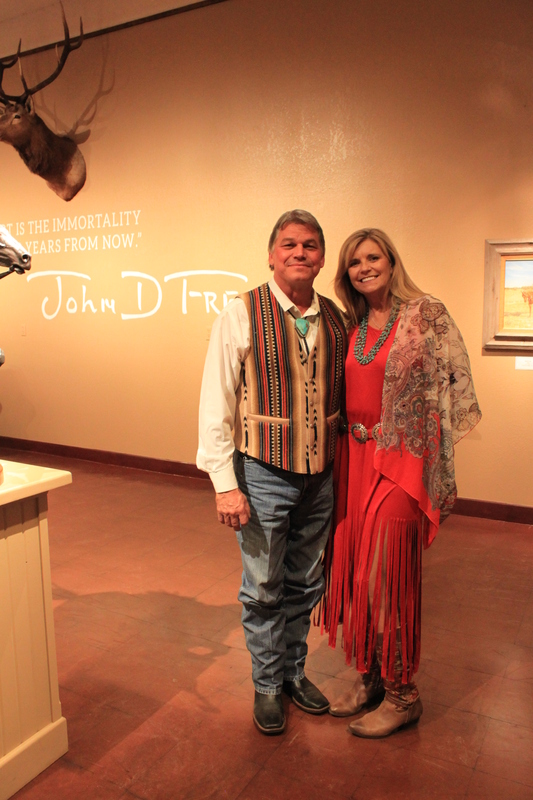 “My uncle John, you may have known him as John D. Free, Western artist, but I just knew him as Uncle John and he was my hero and still is today. Uncle John was an influencer. When you around, when you look at these pieces and you look around at yourself and these pieces, you see influence. You see somebody that really was a time machine in a man because he takes you to a place you’ve never been before. He takes you to a place America was. 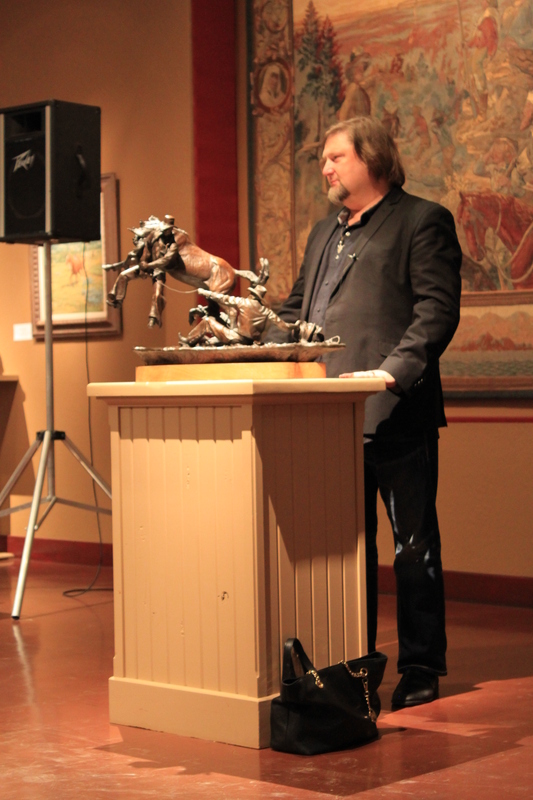 Chris Theis spoke of his uncle’s encouragement to be creative by giving him molding clay when he was a child. Although he did not take up sculpting, Theis found his place as the Creative Director for T.D. Jakes Ministries. “Ginny would just unroll it and it would be a pencil sketch. He gave us more than one, but this one was special because he wrote on it, ‘To a Special Friend,’” August Hague said. August and Ginny Hague recalled a special week they had spent with the artist and other friends when a group of them brought their campers to Pine Bluff to do some work on a church together. “We had a real good time. John and I built a cross and he even made the nails,” August Hague said. “We came back home and we all said ‘we need to do that again,’ but we never did. It’s sad, but we never did,” August Hague said wistfully. 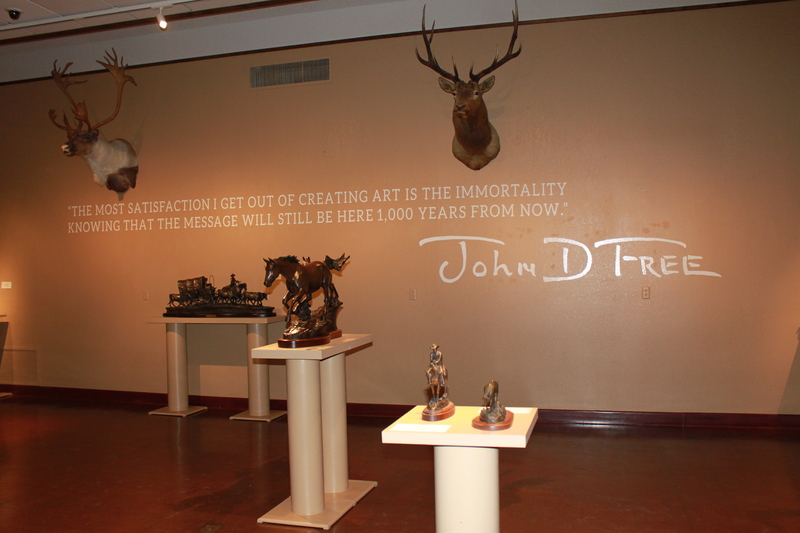 The John D. Free Tribute at Woolaroc Museum continues through Dec. 31. The exhibit, includes some sculptures for purchase. Woolaroc Museum may be reached by phone at: 918-336-0307. Directions are part of the telephonic recording. Woolaroc’s winter hours are: Wed. – Sun. 10 a.m. – 5 p.m. Woolaroc is closed on Mondays and Tuesdays. Visit their website at: http://www.woolaroc.org/ to learn more!